Which new spring product are you loving the most or are most excited to try? I’m loving the MAC Supreme Sheen lipsticks that were released last month – lightweight, pigmented and comfortable to wear. I’m desperate to get my hands on more! EauMG – Is EauMG seeing green fairies? Maybe. Review of aroma M Geisha Green perfume. Nouveau Cheap – There’s a product at the drugstore that can truly fix a smudged nail and Nouveau Cheap’s got the pics to prove it! 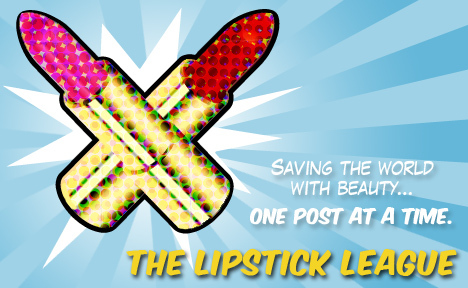 Lipglossiping – Gets overtaken by a sudden lipstick urge, and we all know that’s one itch that NEEDS to be scratched! Orange to LA – Uses the new Lancome ‘Warm Lavande’ Color Design Eye Shadow Quad to create a look for a night out with her husband. Who doesn’t like purple? Pink Sith – Gives you a sneak peek at the NEW Guerlain Rouge Automatique lipstick. It’s a packaging Hoor’s dream! Phyrra’s – Independent Spotlight for April is with Venomous Cosmetics! Learn about Tracy & her fascination with the vibrance of creatures found in nature, as well as her makeup. Vampy Varnish – Shows you some colorful Inglot Eye Shadow Swatches! we heart this – You’ve heard of RevitaLash, but does it really work? Take a look at our before and after pics and decide for yourself! Beauty Junkies Unite – was never too crazy about mood lipstick, but these mood nail polishes from In The Mood are right on trend with spring’s color forecast! How about you, readers? Which new spring product are you loving the most? I’m really excited to try Quite Cute. Thank goodness it’s coming out this week.